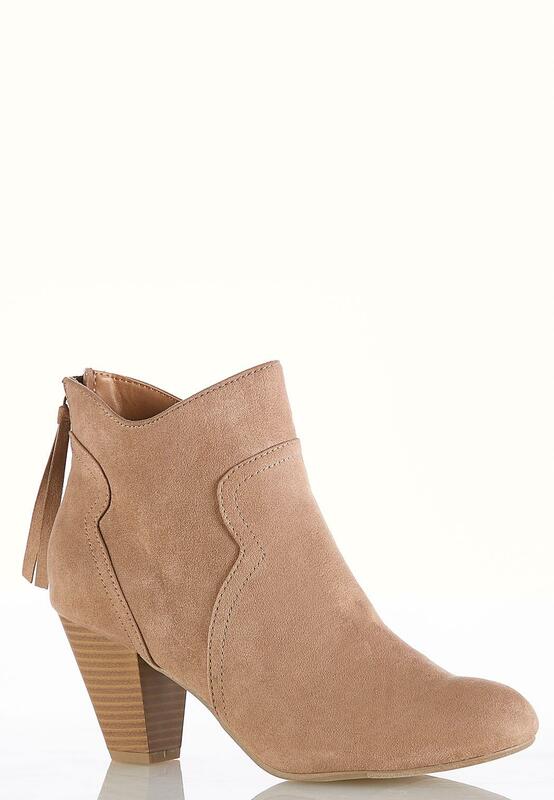 Classic style goes a long way with these standout booties, featuring a soft faux suede and a zippered heel to prove they are sleek, chic and ready for anything. I absolutely love these boots! The heel is just the right height – high enough to look fashionable but low enough to be comfortable. I am on my feet 80% of time at work. These ankle boots are so comfortable. I have short, fatwide feet which takes me quite some time to find the right shoe. These are perfect. As a career woman, long hours and comfortable shoes are my best friend. I have worn these 10 or more hours straight with no pain or only to do it all again the next day. I can go from work straight to a night out. I came back to buy another just in case pair but they are out of my size, 8W. Is it possible to bring this same exact ankle boot back in more colors I would love an olive, camel,and blush pair. Either way these are my everyday, pairs-with-anything, ankle boot. Please bring them back.